Is the Electric Guitar Dead? Fender Guitar is undergoing a digital transformation to return the instrument to its former glory as the core instrument of pop music. However, the company needs to balance digital innovation with its sensitive 'purist' customer base. Fender is one of the two preeminent guitar companies in the world. The Fender Stratocaster was made famous by artists including Jimi Hendrix, Eric Clapton, David Gilmoure, John Lennon, and many others. Since debuting in 1946, Fender has helped transform many genres of music including Rock N’ Roll, Jazz, Country, Pop, and more. In the last 15 years, the rise of EDM (Electronic Dance Music) and other genres such as hip hop have diminished the prominence of the electric guitar as the key instrument behind radio hits. In 2013, Forbes magazine published an article entitled ‘The Demise of the Electric Guitar’ which stated that as EDM has increased its presence on the Top 40 charts, guitar sales have been dropping (1). Evidence of this trend is industry wide: GuitarCenter and Gibson Guitars ( The Pepsi to Fender’s Coke ), are both reportedly at risk of filing for Chapter 11 bankruptcy (2). Sales of Electronic Music equipment (DJ equipment, music production software, etc.) are on the rise (3). Fender has not sacrificed guitar quality despite low-priced overseas competitors, and is still viewed as a standard for high-quality guitar manufacturing. 45% of all Fender instruments purchases are by first-time players. 90% of these first-time players abandon the instrument within the first 12 months. The 10% who commit become lifelong customers and purchase multiple guitars, amplifiers, and other equipment. 50% of new guitar purchases were by women, and females are much more likely to purchase online than in brick and mortar stores. New buyers spend four times as much on music lessons as they do on equipment. These findings provided Fender with important strategic insights. Mainly, the guitar industry faces a churn issue of 90% for new product users. However, users who stick with the instrument have a large lifetime value to Fender (often moving from a $200 instrument to multiple pieces of equipment running in the thousands of dollars). 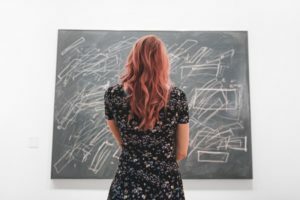 These insights also lead to a simple conclusion, “Even a slight improvement in that 90% abandonment stat could lead to a meaningful boost in sales of Fender guitars and amplifiers. 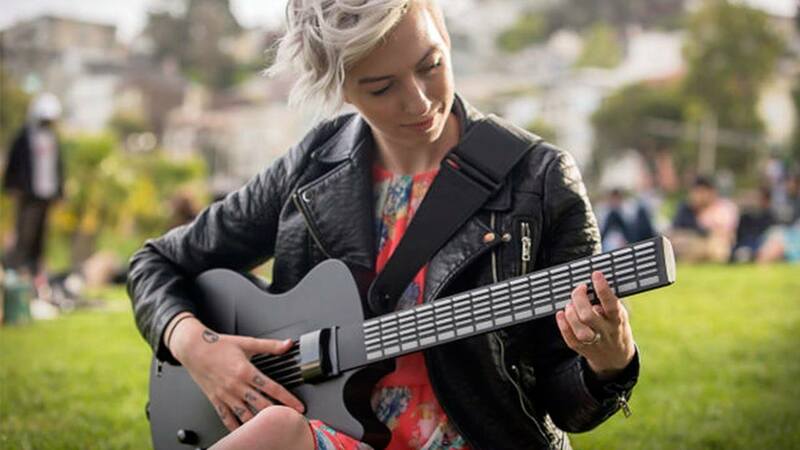 Even a 10% increase in the number of beginners who stick with it, Mooney says, could double the size of their hardware business.”(6) Secondly, online provides a safer forum for females to engage with guitars due to their reluctance to spend time in a brick and mortar guitar store. In order to capitalize on these learnings and implement digital transformation strategies, Mooney started recruiting well known music tech leaders into senior management. With this new team in place, Fender doubled down on the music lesson space by introducing Fender Play. 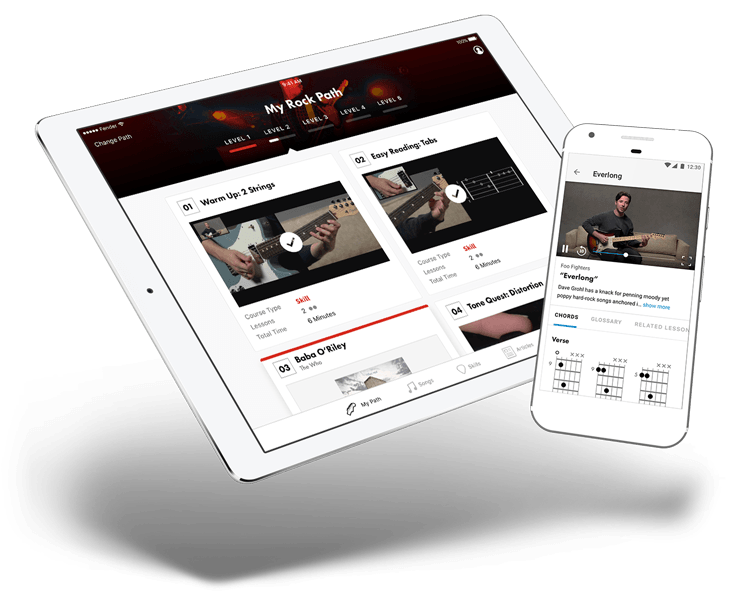 Fender Play is a comprehensive online music lesson platform which aims to increase the likelihood of success of a beginner. For $9.99 / month, users have access to a comprehensive set of song tutorials, lessons, chord instructions, and much more (7). Every video and exercise is filmed in high quality to make the learning interactive and easier to grasp. Fender Play is also based on musical preference, so a beginner receives customized lessons and tutorials based on the type of music they want to learn how to play. Despite positive reviews (8) for Fender Play, there are still considerable risks Fender faces in their current digital transformation strategy. First, the online music lesson category is a crowded space and has many free alternatives, most notably YouTube. The search for ‘Beginner Guitar Lessons’ returns 1,980,000 results and there are already numerous YouTube channels dedicated to lessons. Therefore, Fender needs to build a strong enough competency in music education and app quality to justify the $9.99/month price point. 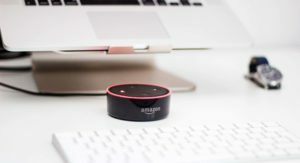 It is no secret that the goal of this initiative is to reduce the 90% churn, so one recommendation would be to grant a one year free subscription to customers who purchase a Fender guitar or amplifier. This strategy can generate loyalty, give Fender deeper insights into their customers, and can create opportunities to sell more Fender products. Secondly, Fender’s digital strategy is beginning to move beyond software apps and into technological improvements to their equipment. As an example, Fender recently launched a ‘Fender Mustang GT Series” of guitar amplifiers that are bluetooth / wifi enabled (9). These amplifiers can connect to a Fender app which allows users to change tones, and manipulate the amplifier in other ways. Beginning to transform the hardware of Fender products to utilize digital technology is a fragile and risky proposition. This problem illuminates one of the largest fundamental challenges that Fender (and the entire guitar industry) faces: appeasing the ‘purists’ while still innovating. A case study best illustrates this point. In 2007, Gibson Guitars (Fender’s largest competitor) introduced the Robot Guitar (renamed GForce): a guitar that automatically tuned itself when a user strummed the strings. One can imagine why Gibson thought this technology was a good idea. Tuning is a constant task required for guitar playing, and Gibson had a technology to automate the process. Quickly, Gibson added G-Force to every new guitar it was releasing (removing the ability of a purchaser to decide if they wanted it) and consequently raised prices (10). The uproar from the guitar community was overwhelming negative. “After unrelenting pages and pages of negative comments and reviews from guitarists worldwide, and severe pressure from Gibson dealers who threatened to stop selling the guitars unless changes were made, Gibson reverted back to 2012 specs on their product line and dropped prices back to a lower level.”(10) The paradox for guitar companies is that younger players are more likely to embrace technologies, however, older guitar players are more conservative and are still the largest consumer of high end guitars. There is another key question that Fender will be forced to decide during the digital transformation underway in music performance. Namely, is Fender a high-quality guitar product company or a high-quality music product company? The distinction is extremely important given emerging trends in the music product space. In doing so, how will Fender manage its purist core base against younger musicians looking to utilize technology? Over the past few years, interesting new fully digital guitar products have been gaining traction in the market. Technology is creating opportunities for musicians to make music and be creative in entirely new ways. However, these same transformations have created a unique challenge for a company like Fender. The 72 year old company must rapidly develop competencies in new areas and balance the demands of ‘purists’ with younger technology seeking consumers. Fender Play is Fender’s first real march into a category outside of its main domain expertise but cannot be the last if the company hopes to stay relevant in this rapidly changing environment. (1) Owsinski, Bobby. “The Demise Of The Electric Guitar In Music.” Forbes, Forbes Magazine, 8 Oct. 2013, www.forbes.com/sites/bobbyowsinski/2013/10/08/the-demise-of-the-electric-guitar-in-music/. (2) “This Day in Buyout History: Deluged by Debt, Guitar Center Turns to Ares.” PitchBook News, pitchbook.com/news/articles/this-day-in-buyout-history-deluged-by-debt-guitar-center-turns-to-ares. (3) NAMM. “Electronic Dance Music’s Rising Popularity Fuels Growth in DJ Product Segment at the 2014 NAMM Show.” PR Newswire: News Distribution, Targeting and Monitoring, 18 Dec. 2013, www.prnewswire.com/news-releases/electronic-dance-musics-rising-popularity-fuels-growth-in-dj-product-segment-at-the-2014-namm-show-236412141.html. (4) Carbonara, Peter. “For Fender Guitars, The Future Is Digital And Female.” Forbes, Forbes Magazine, 29 Mar. 2018, www.forbes.com/sites/petercarbonara/2018/03/28/for-fender-guitars-the-future-is-digital-and-female/. (5) Instruments, Fender® Musical. “Newsroom.” Fender News & Tech Talk | Fender, spotlight.fender.com/newsroom/news/491/. (6) Titlow, John Paul. “How Fender Is Reinventing Online Guitar Lessons For The Age Of Distraction.” Fast Company, Fast Company, 6 July 2017, www.fastcompany.com/40437554/fender-reinvents-online-guitar-lessons-for-the-digitally-distracted. (7) “How Much Does Fender Play Cost?” Fender Play, play-support.fender.com/hc/en-us/articles/115003266766-How-much-does-Fender-Play-cost-. (8) Fender Digital. “Fender Play – Guitar Lessons on the App Store.” App Store, 28 June 2017, itunes.apple.com/us/app/fender-play-guitar-lessons/id1226057939?mt=8. (9) “Fender Mustang GT Amps – Bluetooth & WiFi Digital Amplifiers.” Fender Guitars, www.fender.com/products/guitar-amplifiers/contemporary-digital/mustang-gt/. (10) Cianci, Bob. 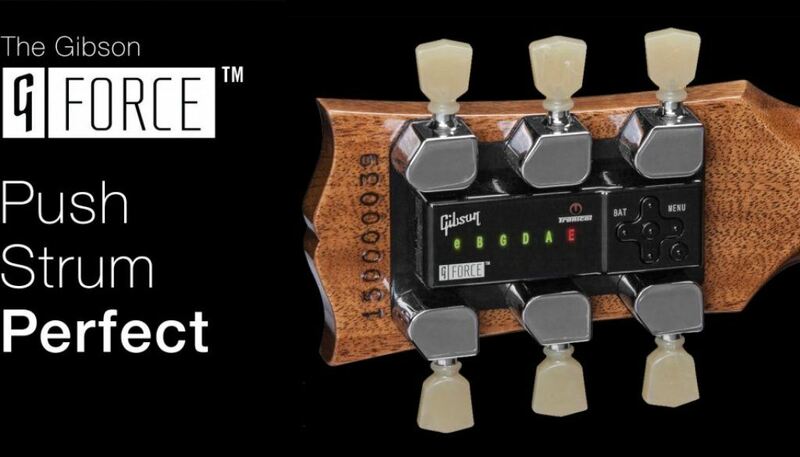 “2015 Gibson Guitars: Cutting Edge Innovation or Epic Fail?” Guitar Noise, 8 Apr. 2016, www.guitarnoise.com/reviews/2015-gibson-guitars/. (11) “Introducing the Artiphon INSTRUMENT 1.” Kickstarter, www.kickstarter.com/projects/artiphon/introducing-the-artiphon-instrument-1. (12) Shemet, Dmitry. 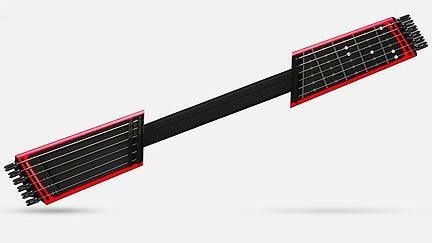 “Jammy – Super Portable Digital Guitar.” Indiegogo, 18 Sept. 2017, www.indiegogo.com/projects/jammy-super-portable-digital-guitar. (13) Instruments, Magic. 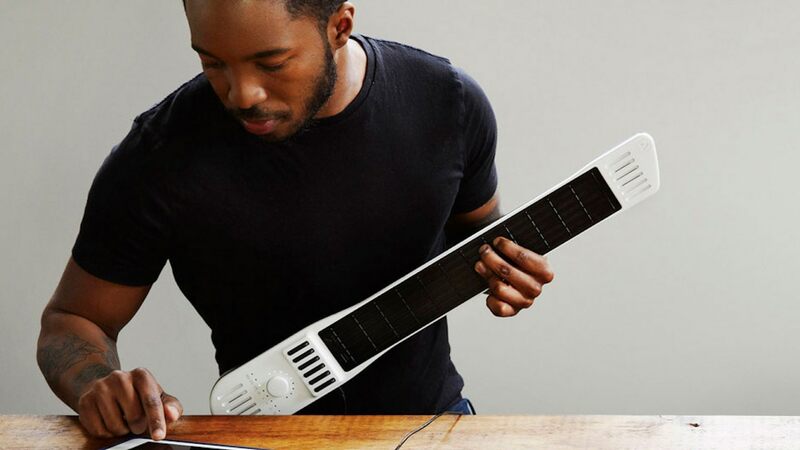 “MI Guitar by Magic Instruments.” Indiegogo, 19 Apr. 2016, www.indiegogo.com/projects/mi-guitar-by-magic-instruments. Thanks for the article Jesse! You raise an interesting question about whether Fender should be a high-quality GUITAR product company or MUSIC product company. I think a Fender would be better off focusing on the second for a variety of reasons. The guitar gained in popularity mainly due to new amplification technology, which greatly expanded the expressive range and flexibility of guitars. Musicians of legacy orchestral instruments probably had similar reactions as Fender’s guitar purists, thinking that amplifying and distorting a guitar was an affront to the natural, acoustic sound of stringed instruments. Interestingly, instruments have long used analog modifications, such as a grand piano’s reverb or sustain pedals, or muted for brass instruments. With the introduction of amps, Fender gave guitarists a new range of sounds that they could control live. Over time, Fender incorporated some amplification settings directly onto its guitars, and allowed musicians to customize pedals and dials on their guitars. In the past 20 years, music has moved to the platforms that provide the most range of expression. Most people create, edit, mix and publish music on computers. DJs can take their music with them anywhere (on laptops or phones), and can flexibily and creatively alter their music during live performances. Fender is smart to pursue education subscriptions, and to try and decrease new user churn/abandonment. But this is an exploitive strategy. I think their focus in guitars should be on keeping the guitar relevant with leading musicians and performers. If the guitar continues to slide in popularity compared to DJs and vocalists, then future aspiring musicians will never think to pick up a six string. For this reason, I really like their Fender Mustang GT Series. This could be a great way for live guitarists to have even more flexibility in sound generation, which could revitalize the guitar in performances. Personally, I think we’ll see the guitar continue to decline, as easier to use, flexible, expressive instruments that have 1000s of sounds at the musicians fingertips continue to gain in popularity. In an age of digital music, we don’t need acoustic instruments, whether they are stringed, wind, or percussive. While there will always be a small group of musicians who continue to learn historic instruments, Fender should be looking for a new instrument — a fender guitar/amp equivalent for the 21st century. Great blog post! I’m one of the people you mention who uses youtube for free lessons and can’t imagine paying for video lessons. In particular the value of a YouTube for me (vs Fenders solution) is that if I’m trying to learn one particular song, on youtube there will be dozens of videos trying to teach me. So even if one person’s approach confuses me, another can help to augment the lesson. 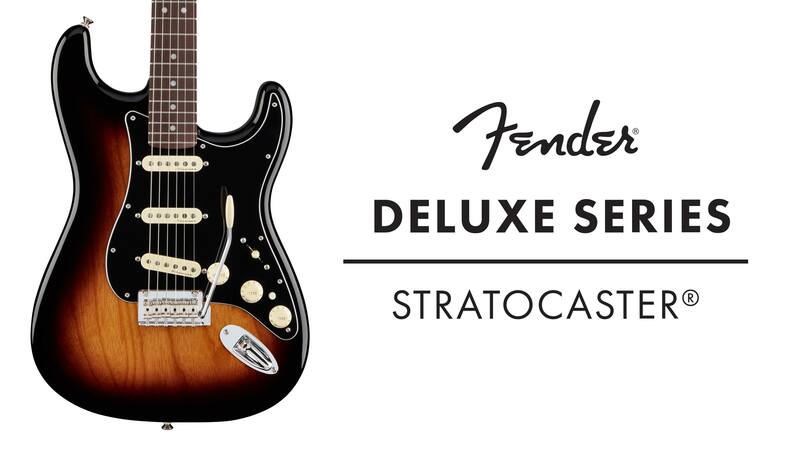 That’s pretty hard for Fender to replicate. Great post Jesse! Two thoughts struck me while reading. First regarding the Fender Play, I wonder if Fender could work with some of the artists who created the original songs to actually instruct the video. I am picturing Eric Clapton in HD walking a beginner through “Layla” for example. There are certainly thousands of covers on Youtube for these classic guitar songs, but Fender has the strength (and to a degree the budget) to contract with the artists to populate the Fender Play platform. We may need to run the numbers and see whether this is feasible! Second, I wonder when a musician decides to stop playing, whether Fender should also be there to buy back their guitars for pennies on the dollar and refurbish them, and then sell them again. I would be interested to see how big the market is for second hard guitars vs new guitars, and I suspect with the churn rate you’ve described, the second hand market would be quite high. If this is the case, Fender could investigate this business too (I am picturing the DeBeers diamonds case from last year, a bit here), and make a fine, data driven model to get the best buy back price and resale value. Great post man, thanks for sharing something that is interesting and in your wheelhouse of expertise. I love the focus on education and I think Fender could continue to be the leader for new musicians on learning. I used to pay $20 for a half hour lesson at my local music shop that offered lessons. I definitely felt a community in my little music shop but as there are far fewer of those, Fender should take the opportunity to establish a strong online community for new learners especially ones in rural areas. I could even see them taking it a step further, and inputting data sensors on new guitars (similar to the tuning tool) but that can transfer things like practice hours, accuracy %, and complexity to the learning software that the student is synchronized learning with. 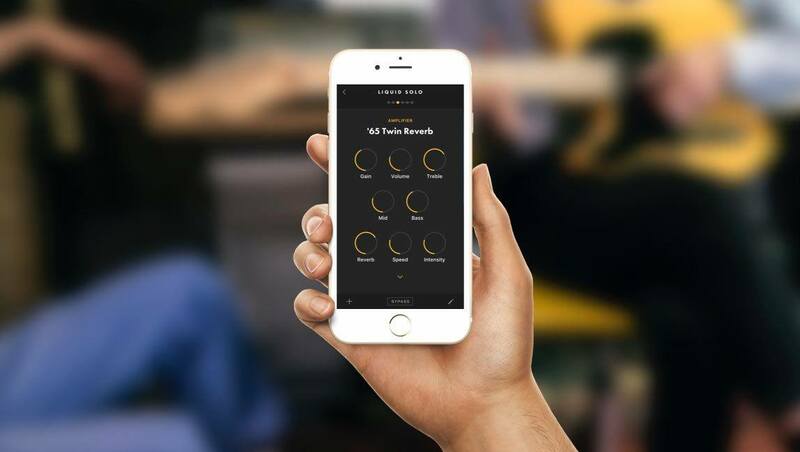 Their app can determine if they have been practicing enough hours just based on the sensory data input into Fender’s cloud. Excited to see what they keep doing as I know I will want access to musical instruments for my whole life, digital or otherwise.